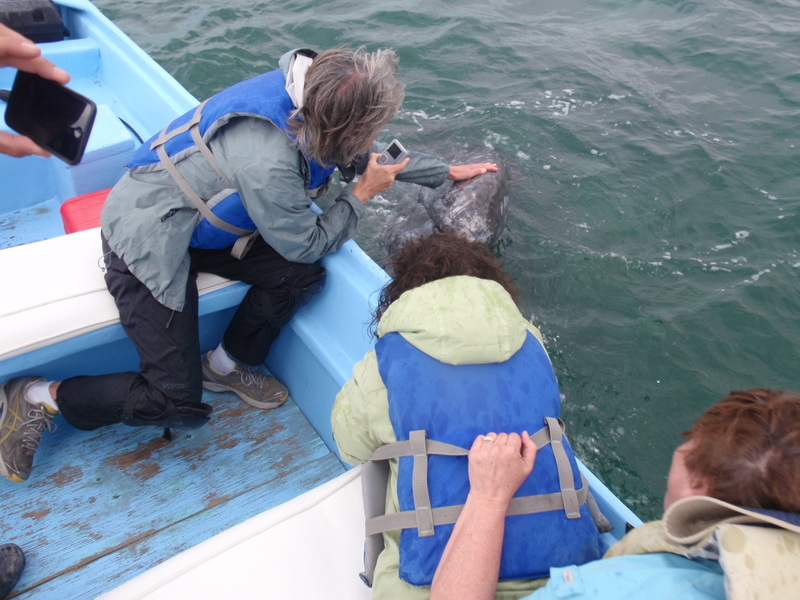 This morning I downloaded the photos from CFL’s camera and discovered to my delight that he had dozens of photos of me with the gray whales at Laguna San Ignacio. While I was squealing like a teenager (along with all the other women on our boat) he was calmly documenting the entire scene. How thoughtful (and lovable) is that? So here you go — here are some of the best whale photos from the more than 500 trip photos that we have between us. Tomorrow (or soon, anyway) I’ll write about and post photos of the birds, the camp, the region, and some of the fun things that we did while in San Diego as well. Seventeen seconds later per the time stamp on the photos, THIS happens! Here you can see mom just below the surface, lifting baby out of the water so we all get a better look! And stays on its side for another close approach. On the third morning we were out on the water with a group of local children on a school field trip. What lucky kids! Watching them play with this baby whale was almost as good as being with the whale ourselves. 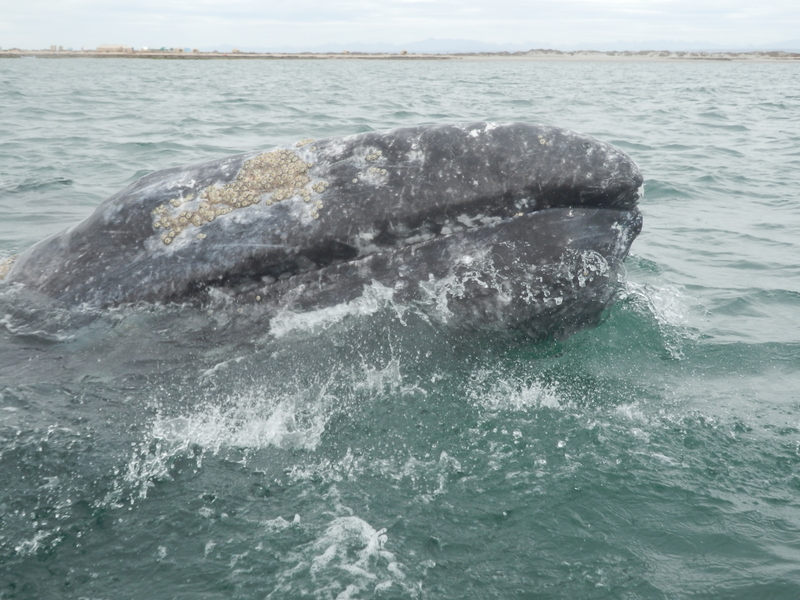 Eventually the kids moved on and we got to take our turn with this exceptionally outgoing whale. Check out this eye shot! I was shooting video that morning. 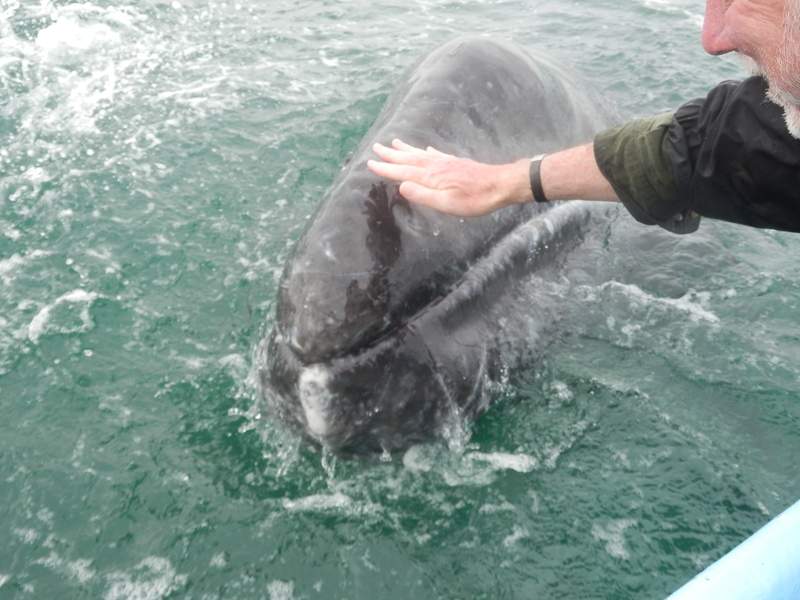 The way I was squealing, I’m not sure I want to post those videos, but as you can see I got a shot of my hand touching the whale. By this time several people had kissed the whale and it was my turn to give it a go. I had no idea I was so far out of the boat when this sequence was taken! From all the upraised hands in this photo, I seem to have just completed that kiss… but alas, there is no photo of that split second. In any case, I’m glad someone finally got a hand on my life jacket! By the end of that morning’s trip, we were all totally wrung out! It was windy out there on the water. 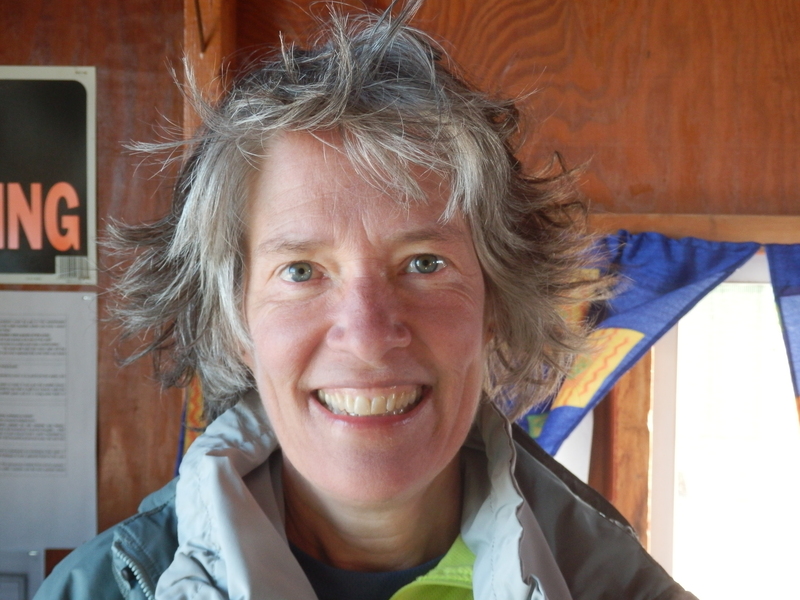 I had put gobs of sunblock on my head, which — combined with whale spray and sculpted by wind — produced a truly stunning hair style. But I can assure you, this is a smile of pure and total joy. I’m so grateful to CFL for his wonderful photos. It brings a new perspective to the whole experience for me… one that I’m pleased and proud to share with you. Yet these photos, awesome as they are, can only give you an idea of what it’s really like. Life changing? Absolutely! Don’t we all have those special events and experiences that we dream about, look forward to, plan for, and then count down the days until they arrive? When they finally do happen, they seem to be over too quickly. We might say that an experience was life-changing, and we might go back to everyday life vowing to be somehow different because of it. And then too soon, everyday life reasserts itself and things go back to the way they were. We might remember the experience with fondness, but it’s behind us now. Three years ago I had a truly life-changing experience. It was a trip I’d wanted to make for years. It was the first and only vacation I ever took without my late husband. We’d had many great vacations together, but his idea of a fun vacation simply didn’t include activities like flying in a small plane and camping on a remote beach. At the time I couldn’t imagine that he’d be diagnosed with cancer four months later, but I was certainly grateful that he encouraged me to take the trip without him. My solo vacation brought me the great privilege of traveling to Laguna San Ignacio in Baja California Sur, Mexico. This is one of the few calving grounds of the Eastern Pacific Gray Whale and the only one that is still essentially pristine. 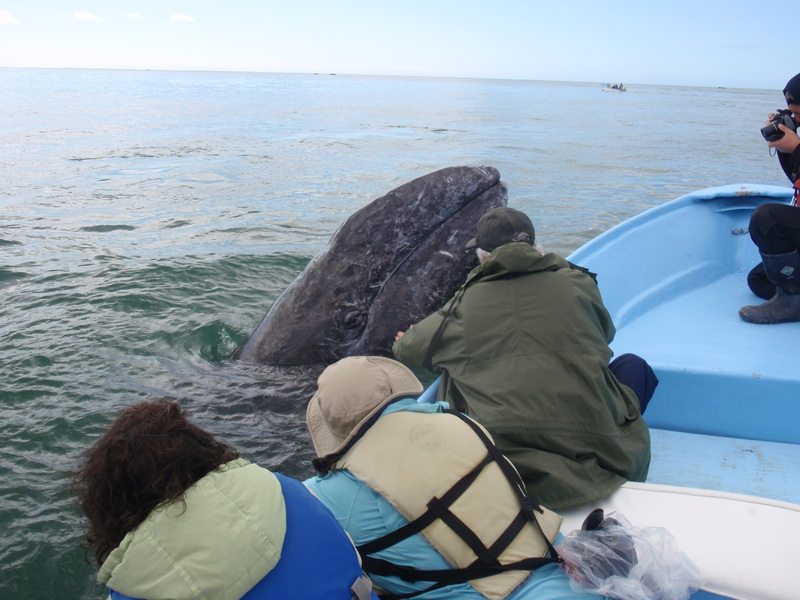 There I stayed for several days at a primitive camp and enjoyed whale watching up close and personal! Some of the calves and their mothers are “friendly” — they swim right up to small boats and seem to invite touching. This behavior began in the 1970s when, for unknown reasons, some of the mother/calf pairs began approaching local fishermen. Some of those fishermen, including my host, saw an opportunity in ecotourism. Not all the whales are friendly, but those who are seem genuinely curious and engage with boats and passengers in a playful way. I briefly tapped a couple of calves during my time there. 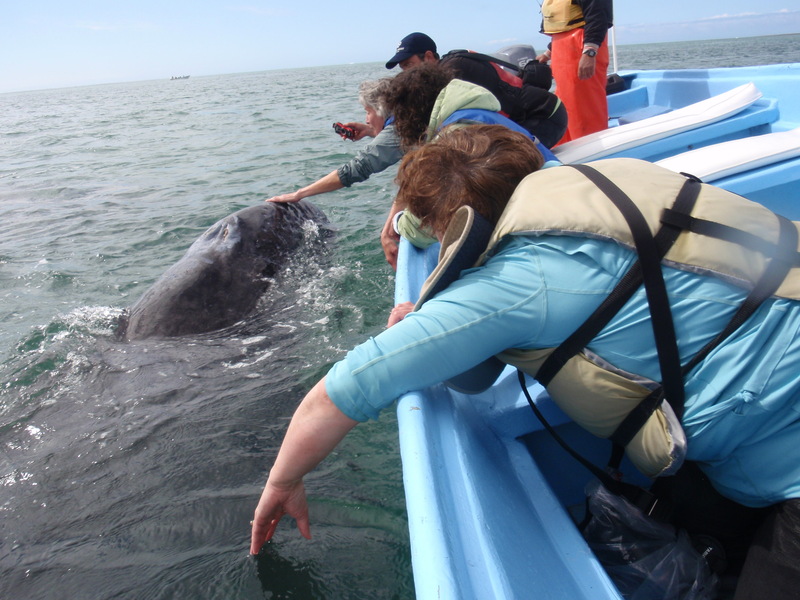 As great as the touching is, however, the truly life-changing moment occurs when a gray whale rolls on its side and LOOKS at you — making direct eye contact from mere feet away. I came home from that trip deeply moved, profoundly grateful, and vowing to return again someday. Fast forward almost three years. CFL and I were talking about adventure travel — exotic places we’d like to go and things we’d like to do. He mentioned Laguna San Ignacio. I hadn’t forgotten my vow to return! I was instantly ready to do it again. We went with the same company as I used last time. 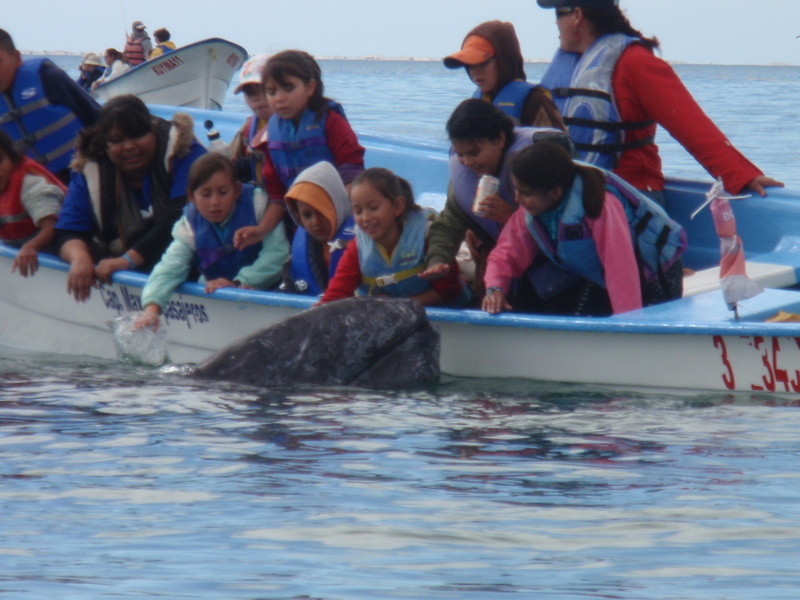 Baja Ecotours is based in San Diego and operates in partnership with a local entrepreneur and his extended family who operate Campo Cortez at the lagoon. We (along with about half of our tour group of eleven people) actually booked our tour through a Puget Sound area whale advocacy group called Orca Network. We all gathered in San Diego on March 4. Early the next morning we boarded a charter bus to Ensenada. There we all squeezed into a very small plane for the two and a half hour flight to Laguna San Ignacio, about halfway down the Baja California Peninsula on the west side. We landed on a dirt runway and were met by our hosts with a cooler full of ice cold beer. 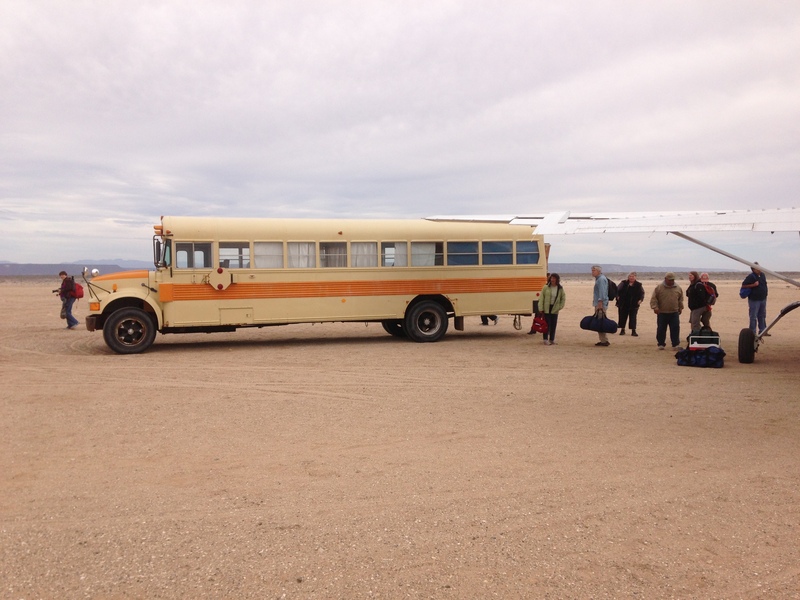 We then boarded an ancient school bus for the nearly ten mile trip to Campo Cortez. Laguna San Ignacio and the surrounding region are a national park, thanks to the efforts of environmentalists and local citizens to protect it against development. In 2010 these groups successfully stopped the Mitsubishi Corporation’s plan to build the world’s largest salt works at Laguna San Ignacio, thus saving the calving grounds. 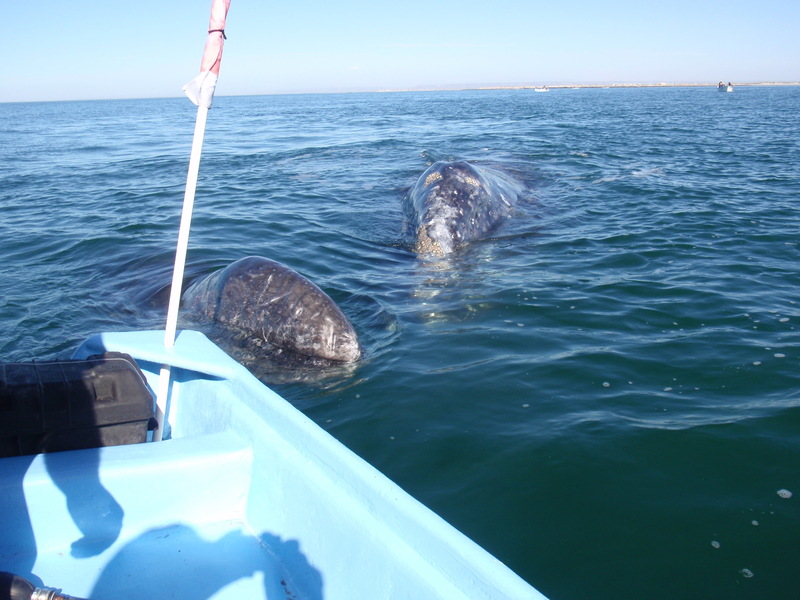 The Mexican government has authorized about a dozen primitive camps and allows whale watching in small (14-16 foot) boats within a small area near the mouth of the lagoon. According to a census taken a couple of days before our arrival, there were nearly 400 whales in the lagoon (about twice as many as were present when I was last there three years ago). About 220 were mother/calf pairs and the remainder were adult stragglers who hadn’t yet begun their northbound migration to the Arctic (mothers and calves are always the last to leave). 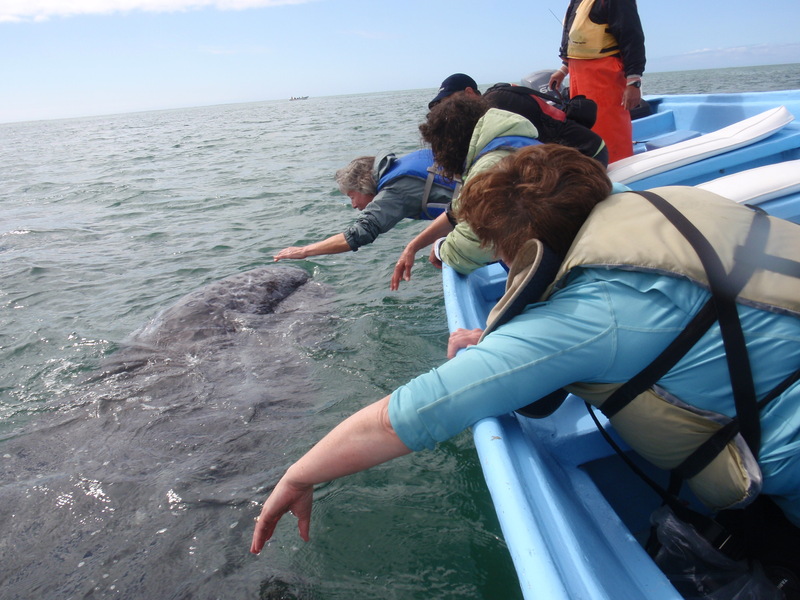 During our three full days in camp we were treated to twice-daily whale watching trips. 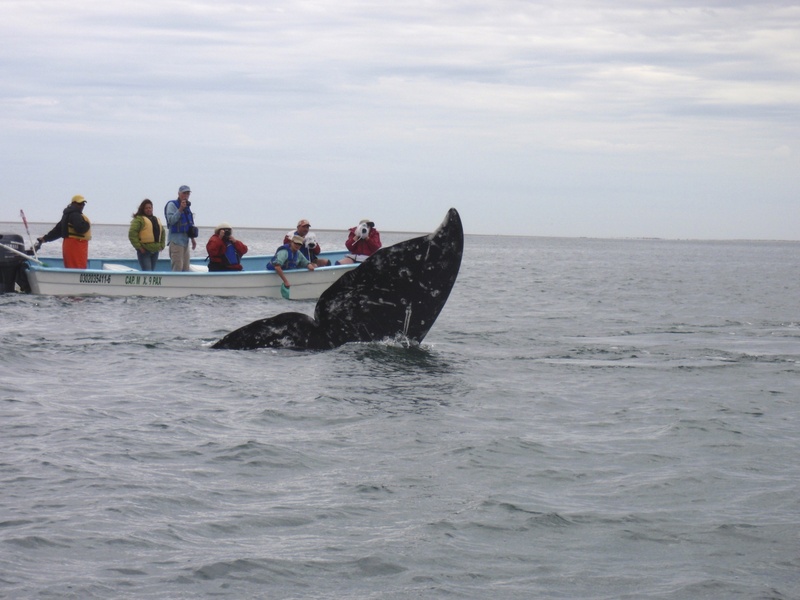 The time within the whale watching area is a closely-monitored 90 minutes each trip. 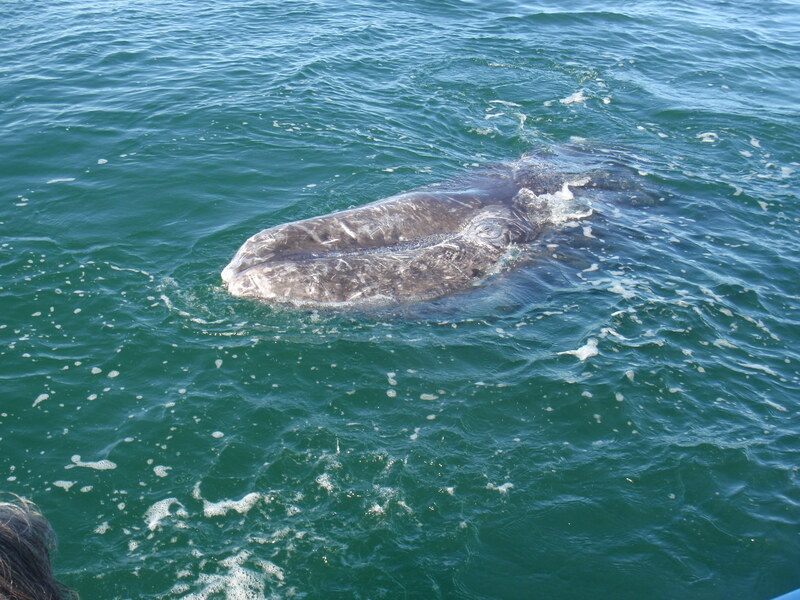 The whales wasted no time getting acquainted! As soon as we entered the whale watching area and idled the boat engine, there were whales everywhere. 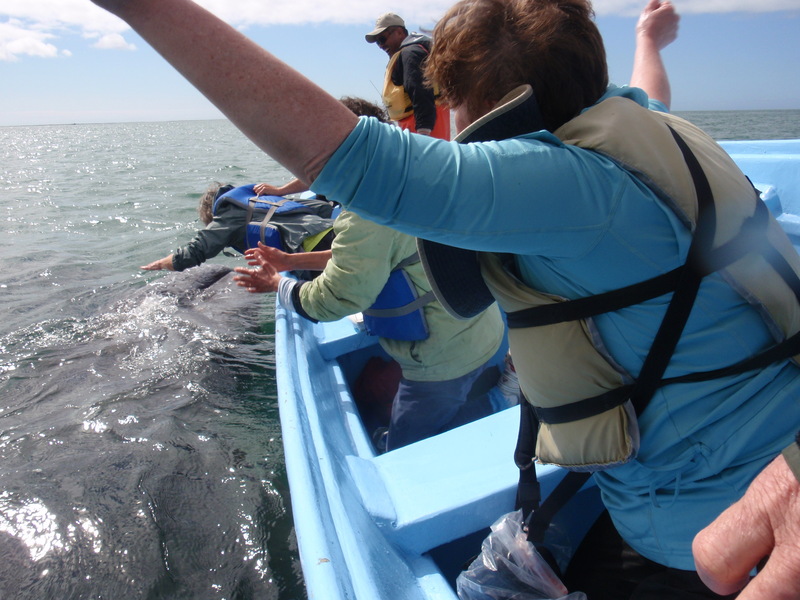 Everyone in our group got to touch a baby whale on our first outing. By the end of the three days, I’d touched babies on four out of our six trips. Here’s CFL getting to know a baby whale. Usually, the moms simply hang close by while “junior” plays. Sometimes a mother will lift a baby onto her back (as if to say “look at my beautiful baby!”) and then nudge it closer to the boat. But for two of the mothers, that wasn’t enough — they wanted to be touched too! I suspect that these particular whales had been friendly when they were babies, and they were just doing what they’d always done… there could be second or even third generation “friendlies” by now. 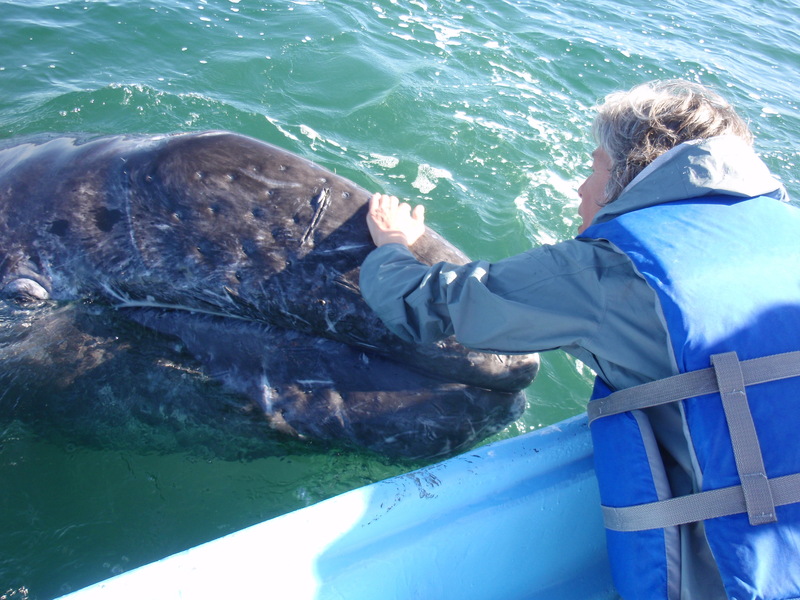 Patting the snout of an 18-foot baby gray whale is awesome enough — but when a 40-foot mother comes to gaze into your eyes and be petted, the intensity of the experience is simply beyond words. Sadly, I have no eye photos… those moments happen so quickly. 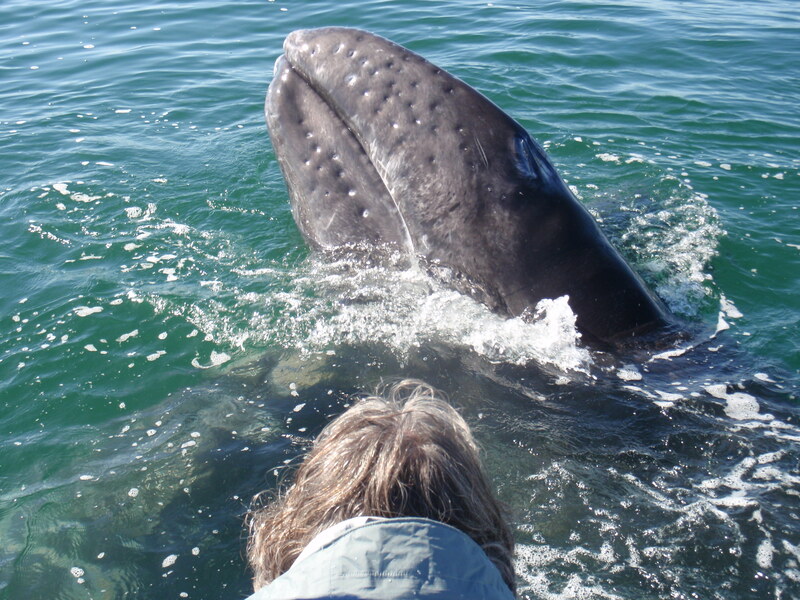 On the morning of our last day (trip 5 of 6) we met up with a baby whale that simply could not play with us enough! Think of an enthusiastic, slightly gangly, but exceedingly playful puppy. This guy (or gal) literally came to each of us on our boat one by one and lingered for extended patting, rubbing, and scratching. 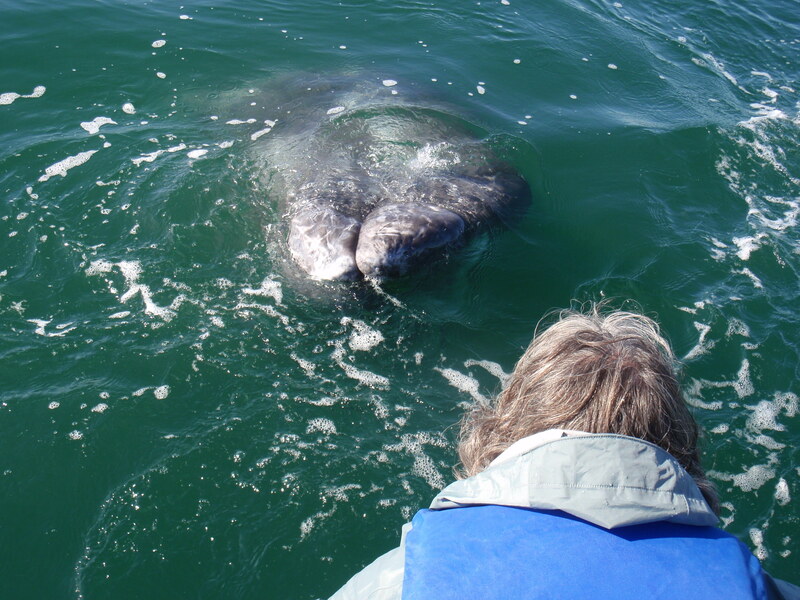 He stayed so close to the boat for such a long time that I and others actually KISSED him on the snout. 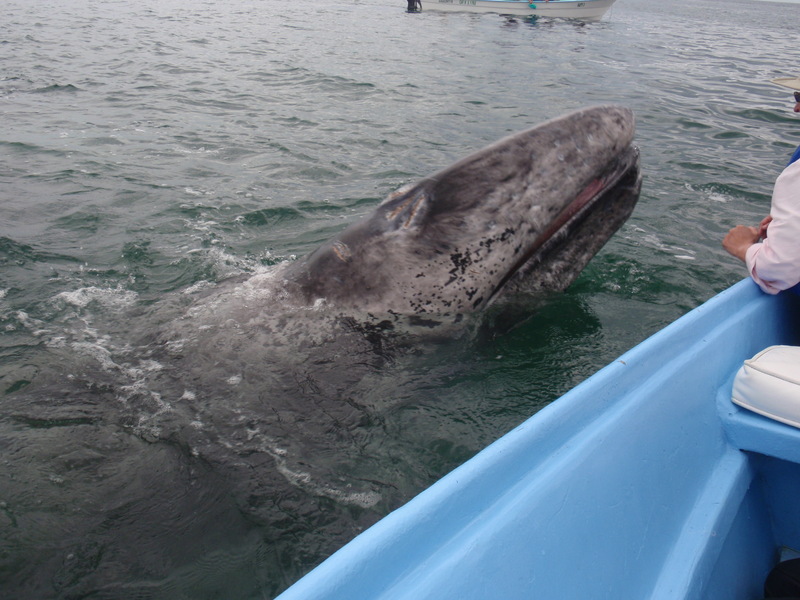 Meanwhile mama repeatedly swam under the boat, bumping it gently and lifting us partly out of the water. It was a wet, slightly wild, and most unforgettable ride. Among the adults at the lagoon, we saw too many spy hops to count, multiple breaches close by the boat, and a bit of flirtatious behavior. These whales were not interested in interacting with us, but our nearby presence did not prevent them at all from going about the business of being gray whales. That’s one of the many things I love about this place. At first it almost seems that we are imposing on their lives… maybe crowding them with our boats… maybe getting in their way. Then I watch them gracefully swimming to us, around us, under us. They know we are there. They could avoid us but they come to us. They could knock our boat right out of the water, but they rub and bump it gently. Their eyes shine with curiosity, playfulness, and intelligence. They are as entranced with us as we are with them. It is a meeting of minds and hearts. Their trust of us — we members of the species that hunted them almost to extinction — is a great gift. I have other stories to tell about this trip — the camp itself, the bird life, and (of course) some great beer tourism moments while in the San Diego area. I have lots more photos to share. But this is enough for today. I hope I have given you a taste and whet your appetite for more. If you ever get the chance… believe me, you will not be disappointed. This is a genuinely life-changing experience. We’ve been home for several days and I’m still processing. I think it’s going to take several more days and several blog posts to sort it all out. For now I’ll just say that it involved international travel and intense wildlife encounters. Oh, and some world class craft beers as well! And yes, the activity streak is still intact. I’ll do my best to tell you all about it soon… It’s just that I have a few hundred photos to sort through and decide what to post here… So please stay tuned!